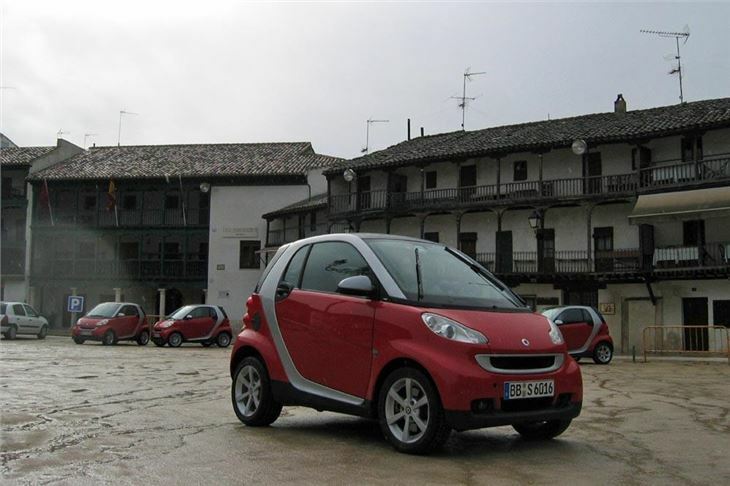 It seems like only a few years ago, but the first Smart City Coupes actually hit the streets in 1998 and since then no less than 770,000 have been sold worldwide. 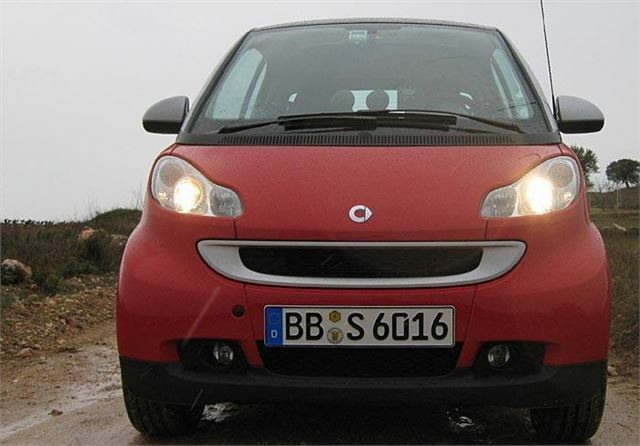 Now it's time for the Smart ForTwo Mark II. 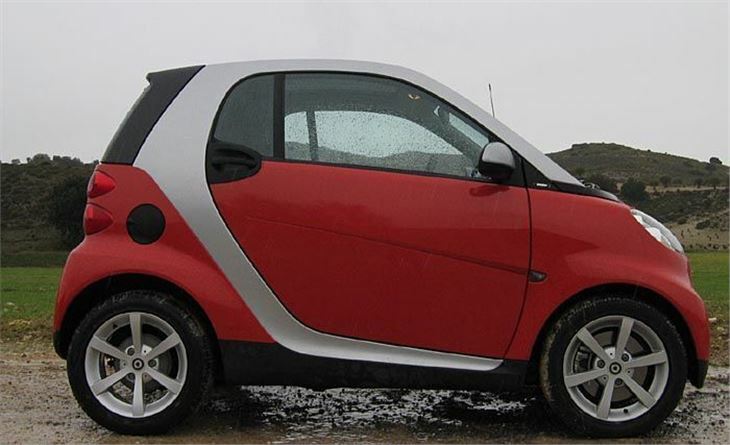 Smart’s expansion plans have failed. 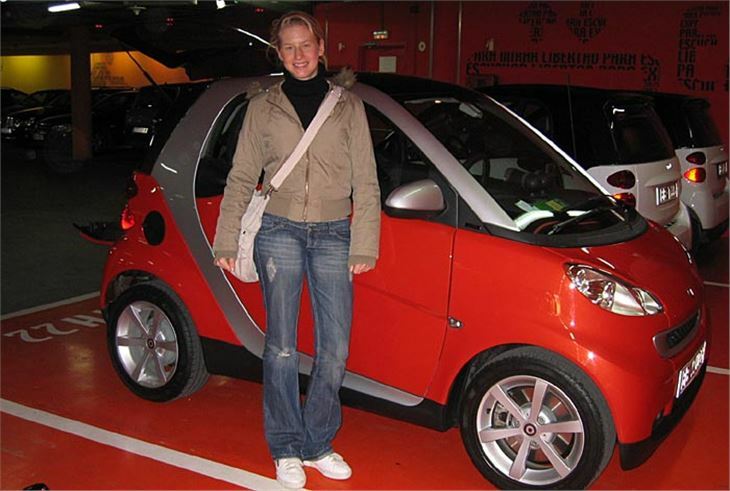 Both the Nedcar-built and Mitsubishi Colt based ForFour and the Roadster Coupe have been shelved because they could not generate enough profit. 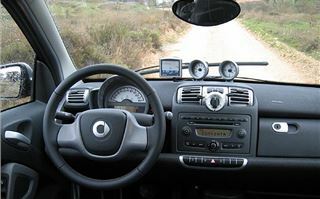 Yet the original concept has continued to sell, especially to city dwellers in Rome, Paris, London, Berlin and Madrid. So now it’s time for a new one. 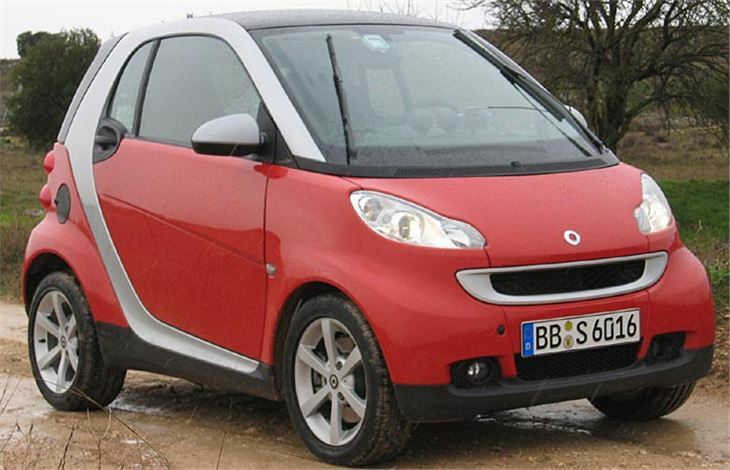 As usual, cars grow, and the new Smart ForTwo is 195mm longer with a 55mm longer wheelbase and 31mm wider track. That gives better crash protection front and back (good enough to sell in the USA) and frees up more room inside for passengers and luggage. You can now get 220 litres behind the seats, or 340 litres stuffed to the roof. 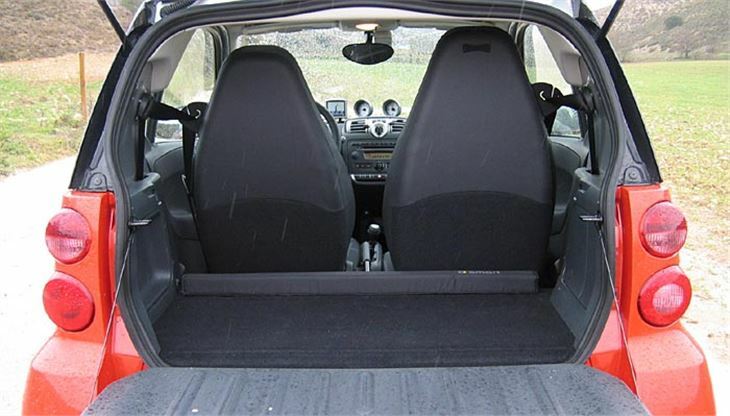 It feels very spacious inside for such a small car. But, despite an 8.75 metre turning circle, at 1,867mm it’s now too long to park at right angles to a kerb. Petrol engines are Mitsubishi-derived 999cc three-cylinder chain cammers with outputs of 61 or 71bhp, or an 84bhp turbo. The UK won’t be getting the 45bhp 799cc diesel because it would not sell in sufficient numbers. Transmission is now a 5-speed rather than 6-speed automated manual with manual sequential change or a button to leave the electronics to do it for you. Power steering is optional. 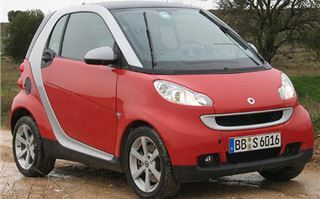 LHD dealer demonstrators arrive at Smart’s 45 UK dealers in June, and RHD customer cars from September. Prices will start at around £6,840. 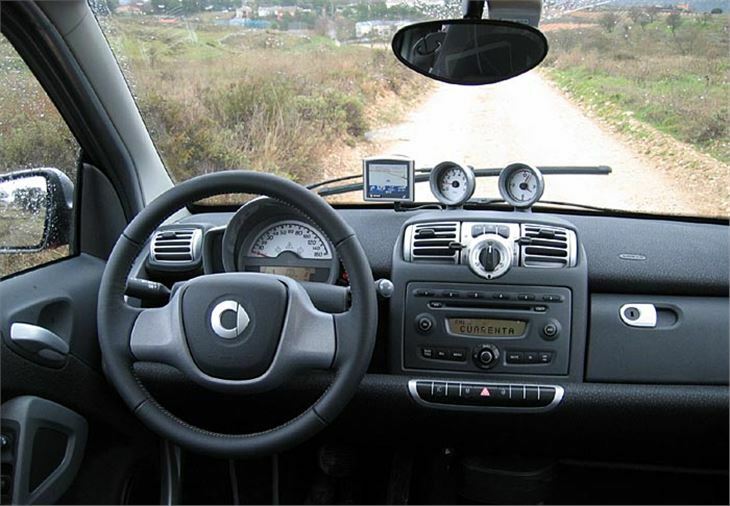 Removable Garmin satnav will be optional at about £300 and will sit in a dashtop shoe with voice instructions via the car’s radio speakers. I drove two ForTwos at the launch in Madrid. 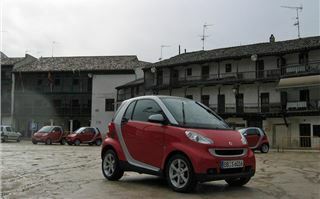 First, an 84bhp turbo with non-assisted steering on a motorway and country route out to Chinchon and back. Then, next day, a 71bhp model with power steering in Madrid traffic. The gearchange is a vast improvement on the old car, but still a bit slow on the upchange when cracking on unless you lift to help it. With the slightly longer wheelbase, ride is less choppy and handling and roadholding more secure, though still ultimately limited by the combination of short wheelbase and tall cabin. You can’t get any real pleasure out of lining it up through a series of bends. Unlike the old Roadser Coupe it’s still no sportscar. 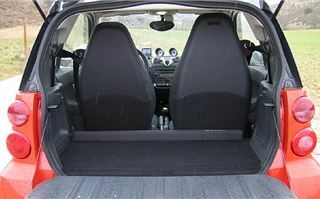 The seats are excellent though, with plenty of thigh support, so you could drive all day with minimum discomfort if you had to. However, the most sensible test came the next day, driving in Madrid city traffic with the help of a charming Madridlena guide. For this I’d picked a 71bhp coupe with power steering and it proved ideal for the task. The engine is both gentler and sweeter, giving perfectly adequate acceleration for city use and, though steering ‘feel’ was sometimes a bit odd, both the car and I, and my guide, were very happy. 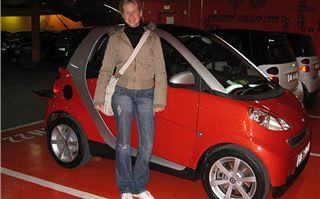 The deliberately tricky route sometimes meant crossing lanes of traffic and, possibly because of the Smart’s modest size or sheer cuteness, other drivers seemed happy to let it in. Narrow side streets were a doddle. Reverse parking showed up a blind rear three-quarters due to the integrated head restraints, but once a driver got used to the car’s length he or she could easily do it with mirrors. In 2009 it’s proposed that the London Congestion Charge for cars churning out more than 224g/km CO2 it will rise to £25, for cars emitting 121 to 224k/km it will stay at £8 a day, but drivers of anything exhaling 120g/km or less will get off with paying nothing. A couple of dozen cars already qualify, and the forthcoming new MINI Cooper diesel also will. 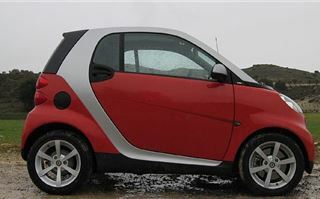 But if Smart and GoingGreen could somehow persuade Ken Livingstone to allocate Smart and G-Wiz sized reduced-price street parking spaces as well, then Smarts will make even more sense as city cars than they do already.